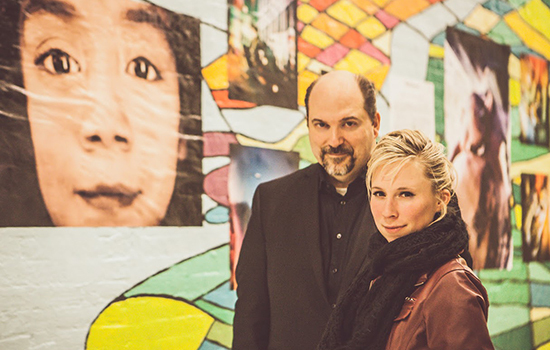 Marc Raco ’88 and Sarah Takako Skinner at an exhibit for the Hope Is Project at Social Innovation Week in New York City in November. Marc Raco ’88 (film) knows hope can be hard to find during challenging times. That’s why he got involved with the Hope Is Project, a transmedia art experiment that uses photography and film to discover hope in people’s lives and spark change. From troubled teens to war veterans, the project shares the stories of people from many walks of life as they embarked on their journey to find hope through the lens of a camera. Participants are given a plastic Holga camera and one simple instruction to photograph hope. The experience allows them to see the world from a different perspective. In April, Sarah Takako Skinner, creator of the project, and Raco partnered with Rochester’s Villa of Hope, a human service organization for families and youth, to help several of its teenagers and adult influencers capture hope and spread their message in the community. The series of images included self-portraits and double exposures of what the participants value in their lives. The images were displayed and auctioned off at The Portraits of Hope Gala hosted by Villa of Hope. After graduating from RIT, Raco worked in filmmaking, marketing and acting. The “artrepreneur” enjoyed producing several documentary, narrative and promotional films and has won eight Telly awards. However, he wanted to do something creative that made a difference. It was through Connectors Collective, a business and networking development group, where he met Skinner. She was interested in collaborating with a filmmaker to put together a promotional sizzle for her project and Raco volunteered to help. After making the video and working with Skinner for several months, they began collaborating as partners on the project. Raco produces videos and helps Skinner curate photos and find participants. Crafting the art of the project’s message is an integral aspect of his job. He makes use of his storytelling skills toward creating a larger message of hope that connects images and the subjects’ stories. The mission is for people to understand the connection between art and purpose and inspire others to initiate their own search for hope.